영국 Ray-Ran사의 Bulk Density Measurement System은 파우더 및 Pellet, Coarse, Cut Fibers 등의 Apparent Density, Bulk Factor 등을 측정할 수 있는 밀도계입니다. 입자크기에 따라 ASTM D 1895에 기초한 3가지 측정 방법을 채용하고 있습니다. Apparent Bulk Density. Ray-Ran offer 4 models which are used are used to measure apparent density, bulk factor, and where applicable, the pourability of plastic materials in forms such as moulding powders. There are three methods according to the ASTM D 1895 standard and one to the ISO R60 standard that are applicable to various forms of these materials that are commonly encountered - from powders and granules to large flakes and cut fibers. The Apparent Bulk Density measurement provides a very good indication of the handling, packing and the space requirements. The pourability parameters indicate of how well the material will flow through feed tubes and hoppers. 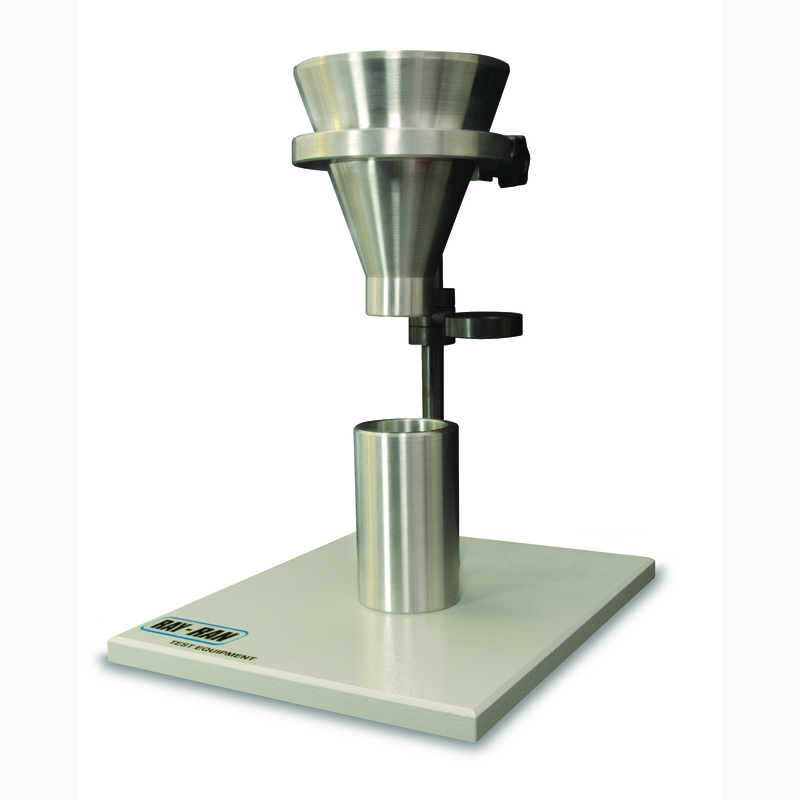 Apparent Bulk Density- The material is freely poured through a funnel into a measuring cup of a known volume. By weighing the measuring cup empty and full, the Apparent Bulk Density is found. Archimedean Buoyancy 원리를 이용한 Density Balances (밀도계)는 액체의 밀도와 고체의 비중을 모두 측정할 수 있습니다. 0.1mg 까지 무게 측정이 가능합니다. 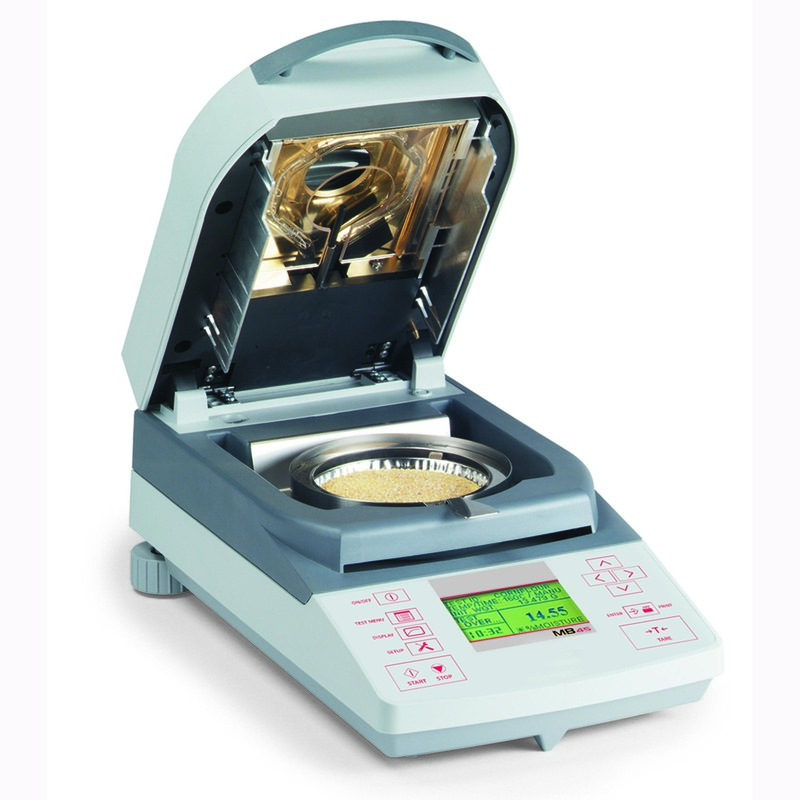 All purpose analytical balance, for parts counting, check weighing etc and which can easily be converted to a Density balance with the addition of the Density Determination Kit. The balance has built in software that will automatically calculate both solid & water densities, with a density table for water at temperatures at 10oC to 30oC built in. As well as the normal weighting functions like statistics, formulation etc. 62g, 110g, 210g, 410g, or 610g capacity versions available, Dual Range model 100 / 210g also available. - Readability 0.1 mg or 1.0mg (0.1 / 1.0 mg on dual version). 정교하고 강력한 2개의 칼날을 사용하여 플라스틱 및 다양한 고분자 재료를 원하시는 모양으로 정밀하게 절단할 수 있습니다. 인체공학적인 설계와 LCD 화면으로 조작이 쉽고 간편합니다. The apparatus is capable of producing notch profiles to all International test standards, such as ASTM D256, ISO 179 and 180. The cutters are made from tungsten carbide which is an extremely hard and durable material. The cutting edges are optically profile ground to very close tolerances. Different cutter profiles are available to suit standard and special notch requirements. The Dual Tooth Cutting Wheels are made from tungsten carbide with cutting edges that optically ground to very close tolerances. The standard wheel fitted to the apparatus is the 0.25mm radius cutter. However 0.1mm and 1.0mm radius, and 0.8mm and 2.00mm �U?notch cutter wheels are available. Ray-Ran is also able to offer wheels to customers specifications if required. Multi-sample loading, Setting rail forming an integral part of the vice to centralise test samples, Variable cutter speed with memory feature, Cutter speed range from 350 rpm to 2000 rpm, Anti-vibration linear motion slide, Variable metric and imperial traverse speeds with memory feature, Traverse speed range from 0.081 mm/rev to 1.0 mm/rev (0.003 in/rev to 0.04 in/rev), Fast return traverse speed, Easy to read digital speed liquid crystal display, Touch membrane keypad, Easy clean removable waste tray, Fully traceable certificate of calibration, Product user manual, CE mark of conformity, 1 year return to base warranty. Adjusted the settings for the notch depth and central position. Notch a test sample and measure notch depth. If necessary, make any fine adjustments. Multiple samples can now be notched. RR/NC - Auto Cycle Test Sample Notching Cutter. NC 051A - 0.100mm Radius Cutter. NC 051B - 0.250mm Radius Cutter. NC 051C - 1.000mm Radius Cutter. NC 051D - 0.800mm "V" Notch Cutter. NC 051E - 2.000mm "V" Notch Cutter. 무게 감지 정밀도가 1.0mg으로 가열시 수분이 증발하는 무게까지 측정 가능하고 최대 50개의 데이터를 저장할 수 있습니다. 사용 온도 범위는 50~200℃입니다. 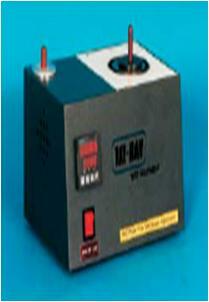 The Ray-Ran MB series of Moisture Analysers are a thermogravimetric apparatus based on the halogen radiator technology. This instrument can be used to measure the moisture content is a wide variety of materials. The MB45 is equipped with a halogen radiator which is more responsive to the heating & cooling requirements than traditional IR heaters. To ensure even heat distribution, a gold plated reflective shield lines the inside lid of the analyser. This gold plating is specifically used for its reflective properties and the ability to dissipate heat. 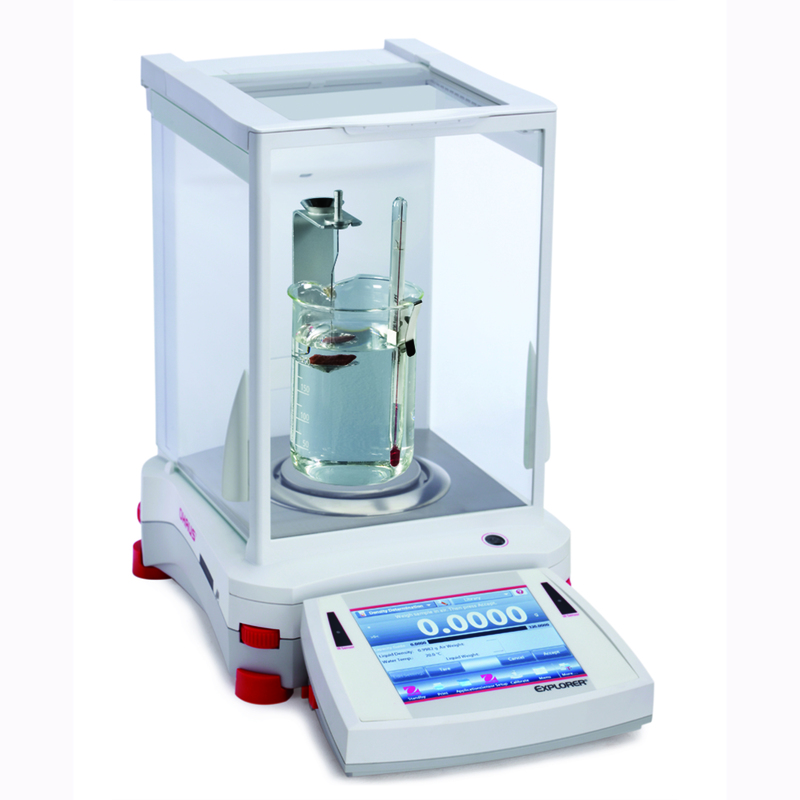 A highly sensitive precision balance is built into the apparatus to allow for the detection of weight changes of 0.001 grams and 0.01% moisture loss. 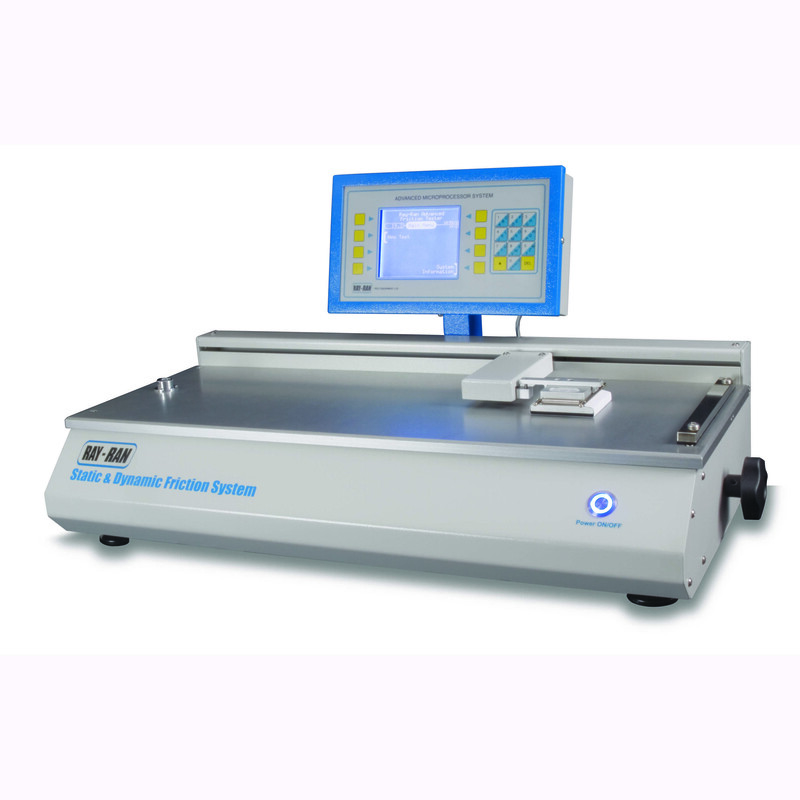 % moisture, % solids, time, temperature, weight, test ID drying curve. The sample material is weighed at the start of the test and again after the heating cycle is finished. The loss in weight equates to the moisture content that has been evaporated. 파우더나 펠릿타입 규모의 적은양의 시료를 사용하여 샘플을 제작하는 장비입니다. 디지털 방식의 온도 조절 장치를 사용하고 상대적으로 저가격대의 경제적인 모델입니다. The Ray-Ran Test Sample Injection Moulding Machine is a low cost sample moulding machine with a compact design for vertical bench mounting. The simple Cylinder/Die extraction system eliminates purging when changing from one colour or material to another. The machine is supplied with a basic cam-operated tool block with Special bearings to accommodate the Increased Pressure which will accept any number of low cost tool inserts machined to any shape that will fit within the Tool Block parameters of 175mm x 40mm x 12.7mm. Tool Inserts to suit any International Standard, e.g. ASTM, ISO, DIN, JIS, etc., can be supplied for tensile dumbbells, colour plaques, impact bars, etc. 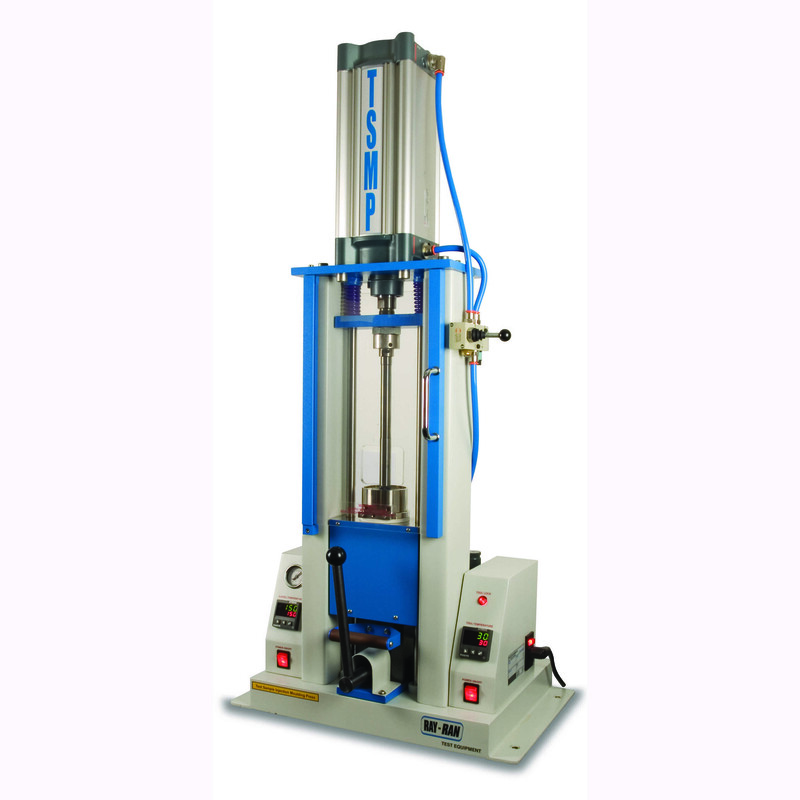 The apparatus has been designed to operate up to 10 bar (150 psi) which is adequate for moulding most materials. Digital heating up to 400 deg C melts the polymer which is the extruded into the mould. Digital tool block heating is included for more efficient polymer flow into the mould with temperatures up to 200 deg C to prevent freezing. Interchangeable cylinders to 70cm3, Interchangable Nozzles & Die�s, Compressor. Test Sample Injection Moulding Apparatus. Will accept very small quantities of polymer in granule, powder or similar form. RR/TSMP 2 - Model 2 Test Sample Moulding Apparatus. TSMP A030 - Basic Tool Block. TSMP 060 - Digital Heating Package. TSMP 022 - Spare Quick Change Cylinder + Lock Nut. TSMP 024 - Cylinder Nozzle. ASTM D1505 & ISO 1183 Method D 에 의해 small solid materials, in various forms, Pellets, Granules, film 등의 밀도를 측정합니다. Digital Readout Density Column. - The gradient column method accurately measures the density of small solid materials, in various forms, Pellets, Granules, film etc..and conforms to the ASTM D1505 & ISO 1183 Method D standards. The density is formed by mixing two fluids having different densities. The resulting solution has a density which when introduced into the column increases uniformly from top to bottom. Ray-Ran's new advancement means that density measurements can be made more quickly and more accurately. The height of the calibrated marker floats or samples introduced into the density gradient are measured using a trammel guided "sight" connected to a positional encoder relaying the height position to a microprocessor so that the density can be obtained without the need for graphs etc. This also means that the Gradient can be calibrated & checked at any time. When a sample material is placed in the density column its height in the column is measured using the trammel system "sight" and the microprocessor then calculates the corresponding density. Pneumatically Operated Cutting Press는 최대 5,000kg의 힘을 적용 시킬 수 있습니다. 커터 종류의 범위가 넓어 플라스틱, 직물, 고무, 합판 등 다양한 샘플에 따른 커터를 선택하여 실험 가능합니다. The Pneumatically Operated Test Sample Cutting Press has been specifically designed to cut shapes such as test samples from relatively flexible materials, such as plastics, fabrics, boards and paper. In most cases, the thickness of the material that can be cut will not just depend on the strength of the material, but also on the lateral flexibility of the material to allow the cutter to penetrate down into, and pass through the material. In other words, if the material is too rigid, the thickness of the material that can be cut will be reduced because the outside edges of the cutter blades will bind in the material, and therefore reduce the available cutting force. The press generates on average up to 5000kg (50KN) of cutting force. The press has been designed to operate up to 10 bar (150 psi) but generally 7 bar (100 psi) will be adequate for cutting most materials. Pneumatically operated, Polycarbonate safety guard, 0?0 bar pressure regulator, Fine height adjustment of cutter, Supplied with cutting mat, Arbour locking tool, Hexagon key, 1 year return to base warranty, Product user manual. Cutting tools to any shape or standard, Different shanks to suit most cutting presses, larger bed & throat sizes can be manufactured, Compressor. 수동으로 동작하는 Cutting Press는 최대 600kg의 힘을 적용 시킬 수 있습니다. 커터 종류의 범위가 넓어 플라스틱, 직물, 고무, 합판 등 다양한 샘플에 따른 커터를 선택하여 실험 가능합니다. Hand Operated Cutting Press. 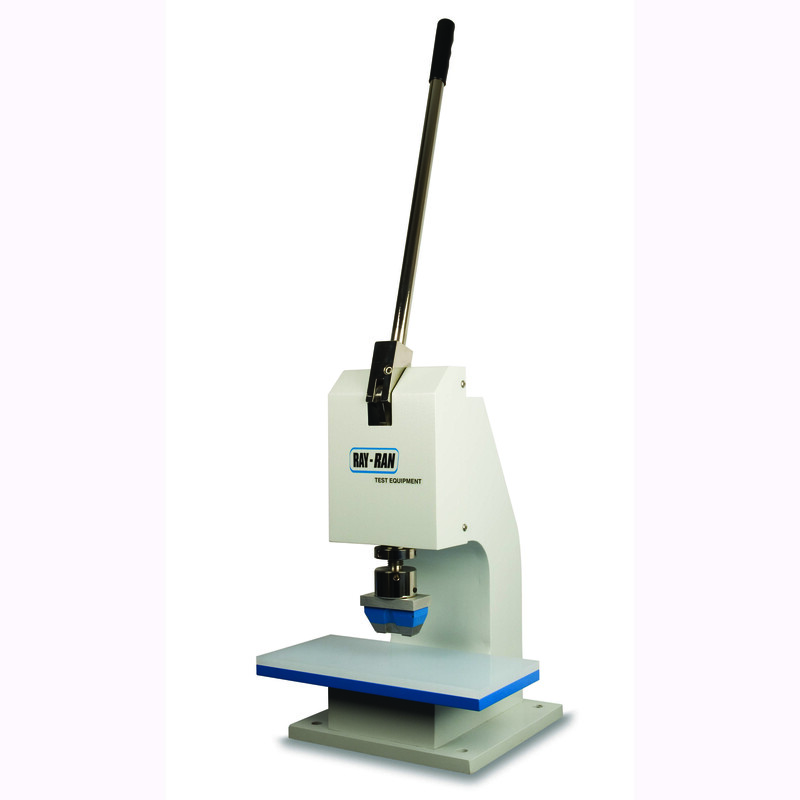 - The Hand Operated Test Sample Cutting Press has been specifically designed to cut shapes such as test samples from relatively flexible materials, such as plastics, fabrics, boards and paper. In most cases, the thickness of the material that can be cut will not just depend on the strength of the material, but also on the lateral flexibility of the material to allow the cutter to penetrate down into, and pass through the material. In other words, if the material is too rigid, the thickness of the material that can be cut will be reduced because the outside edges of the cutter blades will bind in the material, and therefore reduce the available cutting force. The press generates on average up to 600kg (6KN) of cutting force. (Dependant on strength of operator). Fine height adjustment of cutter, Supplied with cutting mat, Arbour locking tool, Hexagon key, 1 year return to base warranty, Product user manual. 디지털 방식을 사용하여 정밀하고 정확합니다. 최대 75mm 두께의 샘플 측정, 다양한 하중(0.27kg,1kg,5kg)으로 반복 재현성이 있는 정밀 경도를 측정할 수 있습니다. 최고 7개의 데이터를 저장 및 분석, 출력이 가능합니다. Durometers measure the penetration depth (into the sample material) of an indentor reacting against a calibrated spring load, and the result is given in Shore hardness degrees, displayed either on an analogue scale or as a digital readout. Durotech MDS Durometers separate the displacement measurement and display element from a module containing the indentor and spring. Additional modules can be purchased at any time if the scope of the material hardness alters. Each module is individually calibrated, its calibration status being unaffected by the host Durometers. Hardness values range from 0 (full penetration) to 100 (no penetration), Full penetration is between 2.46mm and 2.54mm (0.097 and 0.100 in) depending upon the equipment used. It is recommended that shore D is used when Shore A results are greater than 90 and shore A is used when shore D results are less than 20. The pocket MDS Universal Durometer is a robust instrument incorporating a precision analogue movement or digital display. It is traditionally styled with MDS technology, complete with tolerance hands. A maximum hand option is available and the model fits to any operating stand for improved repeatability. The modular setup allows simple & quick changing of shore modules. Fit the instrument with the correct module. Place and press the instrument perpendicular to the surface to be tested and read off the result. D202 Digital Durometer with 1 Module, D20200 For 00 Module.B202 Analogue Durometer with 1 Module, BS550 Durometer Stand. 최대 300kN 내의 로드셀을 통한 강하, 인장 및 압축 모드가 가능하며 측정 정밀도가 높고 내구성이 뛰어납니다. 또한 컬러 디스플레이가 장착되어 보기 쉽고, 사용이 간편합니다. A Universal Testing Machine otherwise known as a materials testing machine or test frame is used to test the tensile and compressive properties of materials. Such machines generally have two columns but single column types are also available. Load cells and extensometers measure the key parameters of force and deformation as the sample is tested. 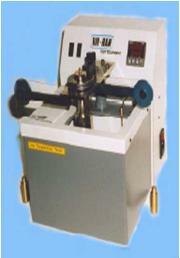 These machines are widely used and would be found in any materials testing laboratory. A typical testing system is comprised of a materials testing machine or test frame, control and analysis software, and critically, the test fixtures, accessories, parts and devices used to hold and support the test specimen. A comprehensive range of tests can be carried out such as Tensile, Compression, Crush, Friction, and Flexural on materials like Plastics, Metals, Paper, Fabric, Yarn etc. 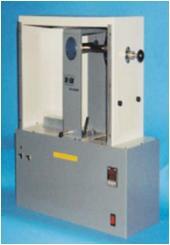 The CT Series bench mounted single or twin column universal strength testing machines. A PC is required for operation & results presentation. These machines use the feature-rich winTest software running under the Windows operating system for control and testing that is compliant with all relevant industry standards. Advanced, standard and complex multistage test procedures are fully configurable and controlled using the standard PC interface. PC systems can be supplied or customers can utilise their own PC. 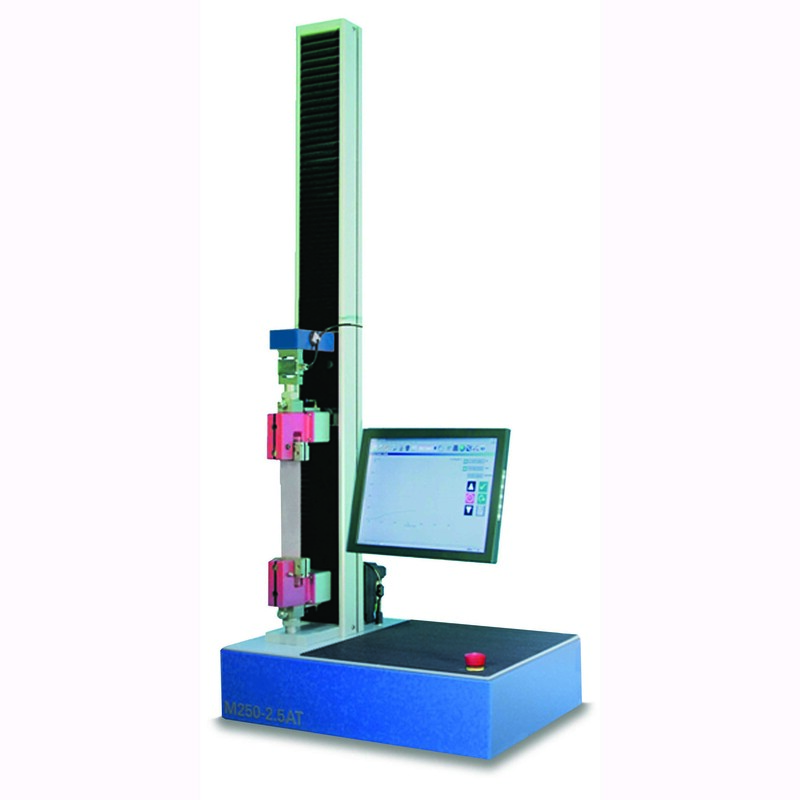 High specification Computer controlled Universal testing machine, Max tension and compression resolution 0.1N, 800% overload capability on load cells, Accuracy of better than +/- 0.5% of indicated reading down to 1/1000th of load cell, Meets and exceeds BS EN ISO 7500-1 1999 Tension Grade 0.5, Compression Grade 0.5 and meets all other International standards, Force sampling rate 1000/s Rigid Dual Column Frame with Crosshead guidance system PC control of crosshead position, resolution 0.001mm, Twin recirculating ballscrews eliminating off centre loading, High accuracy closed loop speed control Test speed 0.001 to 1000 mm/min, RS232 output for PC, Fixed load and travel protection limits, User selectable load and travel limits, PC Controlled load and extension cycle testing, plus long term creep testing, Digital control specimen break detection, Automatic check and adjustment of machine calibration, Impact and overload protection, Auto zero, Direct connection to extensometers, Aluminium extruded columns with integral T slots for mounting of accessories such as extensometers, guards, lighting etc, Supply voltage 200/240V AC or 100/120V AC at 50 or 60 Hz. 400 different grips available, Wedge, Tensile, Pneumatic, spring action etc, 3 and 4 point bending fixtures, Compression Platens, Extensometers, Test Chambers. 샘플에 구멍을 뚫는 방식으로 충격을 가해 충격강도값을 측정하는 장비입니다. 진자방식으로 작동하는 해머를 사용하여 충격값을 정확하고 일정하게 제어가 가능하며 인체공학적인 설계와 LCD 화면으로 조작이 쉽고 간편합니다. In this test the principle is to determine the puncture impact resistance of thin materials, such as films and membranes. The pendulum hammer forms a puncture arm having a tup at the end point to strike the test sample. The tup profile can be designed to suit different types of failure modes. For example, a tup with a large radius end produces a high degree of elongation before rupturing the sample, where as a sharp cone profile produces a brittle type failure. Puncture testing is a new method of determining the impact strength of materials. Although it may appear like dart drop testing, the results obtained are much more accurate and reliable because non failures are not included in the test results. Also, the tests can be used to simulate what can happen in service by using a tup that is the same profile as the component to be packaged. 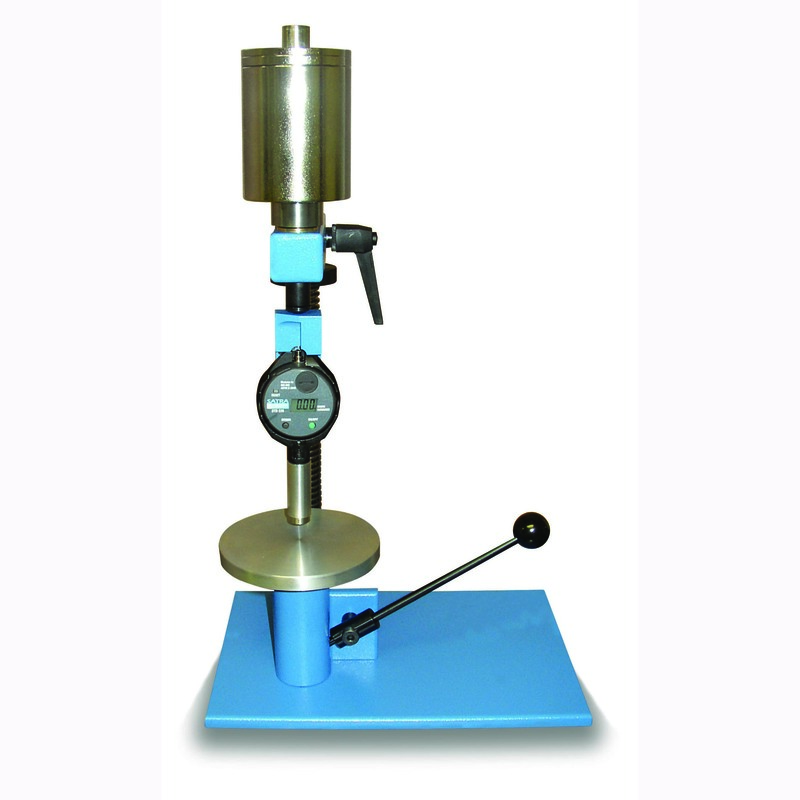 RR/IMT - Pendulum Impact Tester IMT A100 - Puncture Stand RR/IMT/Puncture - 1.30 to 25 Joule Variable Weight Puncture Hammer. 진자식 충격 시험기로써 국제표준규격의 진자방식 해머를 사용하여 충격값을 정확하고 일정하게 제어하며 Izod Test, Charpy Test, Tension Impact Test, Puncture Impact Test, Component Test 5가지의 측정방법을 사용하고 있습니다. 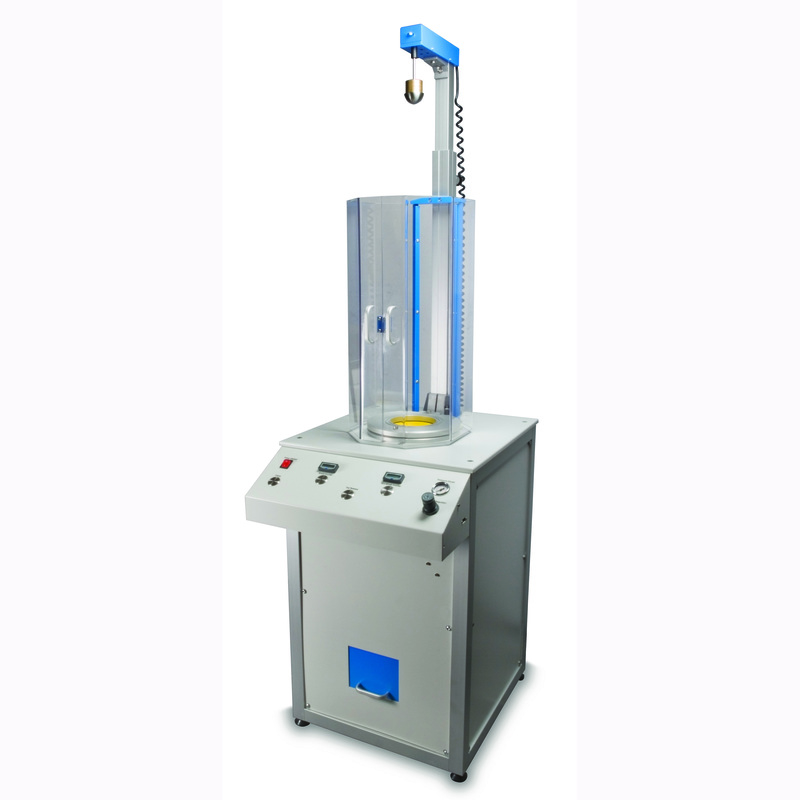 Advanced Pendulum Impact Tester determines the energy required to break or rupture specimens of plastics or ceramics. The apparatus conforms to all of the international test standards including ASTM D256, ISO 179 and 180 for Izod, Charpy Testing , ASTM D1822 for Tension Impact Testing and other recognised standards. The design utilises advanced dedicated microprocessor technology for simplicity, ease of operation, high accuracy and repeatability of results. This apparatus is extremely versatile and allows impact velocities from 1.5 m/s up to 3.7 m/s combined with variable weight hammers to give an impact energy range up to 50 Joules. A special impact energy diagnostic programme has been included to assist the operator to select the correct size of Hammer for the Standard and material being tested. The SCADA Software enables the Tester to be controlled via the PC. SCADA allows the use of recipes to upload frequently used test parameters and combine them with a operating strategy which ensure the procedures are correctly carried out. The test parameters and operating results can be displayed on screen, printed and/or archived as standard CSV files in which can be viewed or manipulated in Excel. 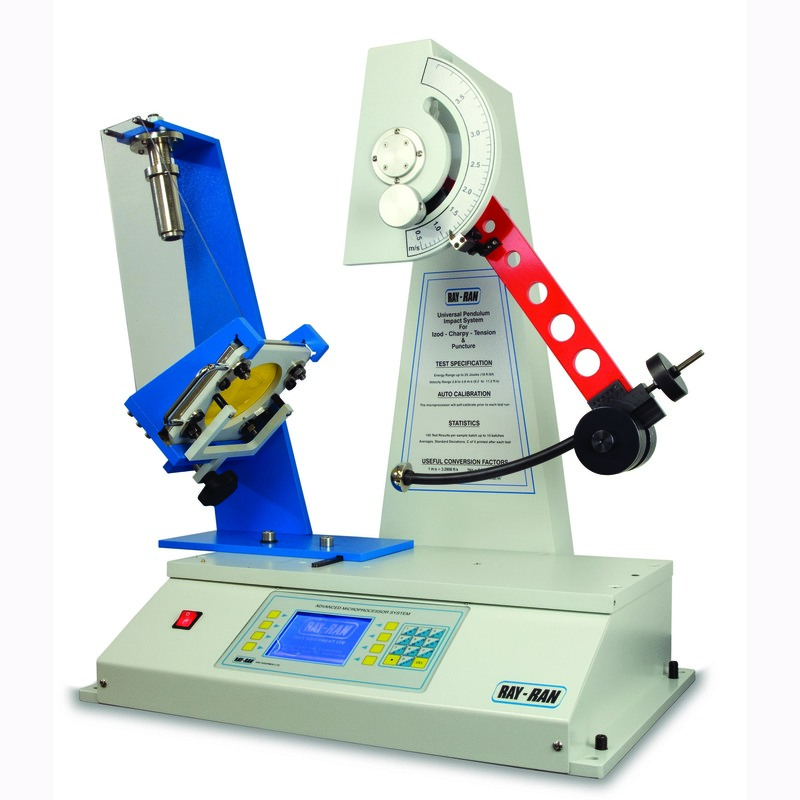 The apparatus also offers a Self Calibration procedure for bearing resistance and windage. Advanced dedicated microprocessor control, Touch membrane Alpha / Numeric keypad for data entry, LCD display for sequence logic menu auto prompt selection, Yes / no mode selector, RS232 output with data transfer lead, Specview ?Scada?software to allow PC control of Tester and real-time viewing of results, Self-calibration procedure, Results downloaded to PC for spreadsheet analysis, Metric units of measure, Ability to store User Names and Material Types, Recipe Manager to store and upload data, High resolution positional encoder, Variable pendulum velocity, Solenoid pendulum release with audible pre-warning, Levelling device, Full safety guarding electrically inhibiting operation when not closed, Fully traceable certificate of calibration, Product user manual, CE mark of conformity. Variable Weight Hammers for Izod, Charpy or Tension Impact, Izod, Charpy or Tension Impact Clamps & Vices, Special clamps, fixtures and hammers for component testing, Guard Enclosure, Low Temperature Chambers, See also TSMP, Presses and CNC machine for sample preparation, also Notch Cutter for producing the notch in the samples. 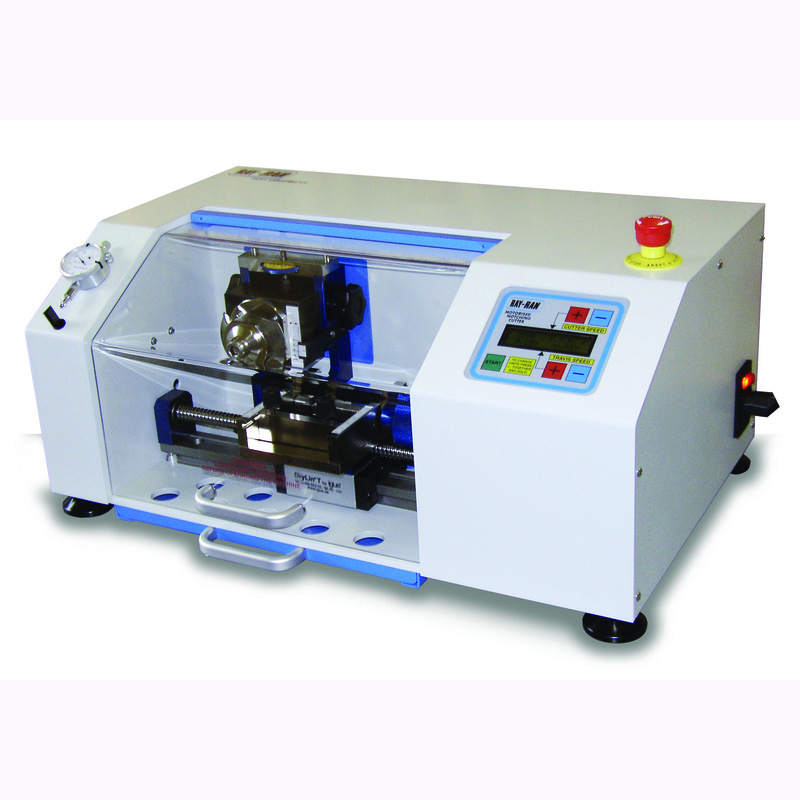 RR/IMT - Advanced Universal Impact Tester. IMT A075 - Izod Vice (also available Pneumatically operated), IMT A082 - Charpy Rest, IMT A089 - Tension Impact Fixture, IMT A054 - Izod ISO & ASTM Hammers, IMT A061 - Charpy ISO & ASTM Hammers, IMT A068 -Tension Impact Hammers. 낙하식 충격시험기입니다. 공기압을 이용한 자동식이므로 사용이 편리하며, 무게에 따른 하중을 선택할 수 있어 다양한 샘플 측정이 가능합니다. 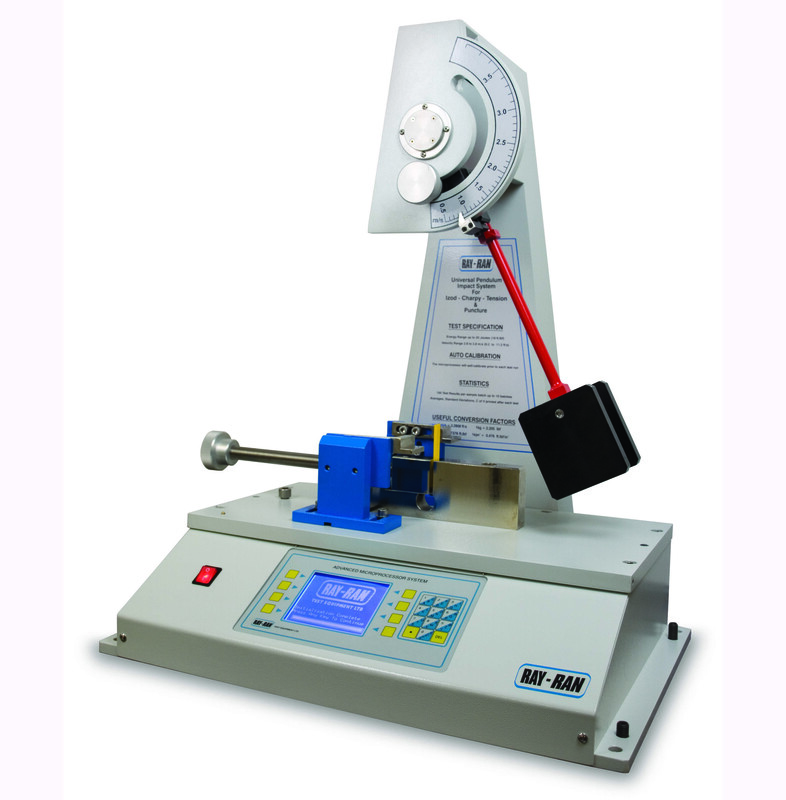 The Ray-Ran Advanced Falling Dart Impact Tester has been designed to determine the impact resistance of plastic films, papers and composite sheets by use of a free falling dart. This instrument complies with the ASTM D1709 Method A & B and ISO 7765. The sample is clamped in position, and a dart of known weight is allowed to fall from a either 660mm or 1500mm and hit the sample. The energy required to break the samples is expressed in terms of the weight (mass) of the dart which would result in the failure of 50% of test pieces taken from the sample under test. The test methods are designed to enable the operator to achieve the result by extrapolation from the figures obtained by testing at a number of different drop weights, on a significant number of test specimens. The determination of the result is obtained using the staircase method. The dart weight is decreased or increased by uniform increments after each test, depending on the result (failure or no failure) in the specimen. RR/FD Advanced Falling Dart Impact Tester. 열변형-연화점 측정 시험기로써 열변화에 따른 샘플의 변형을 측정하는 장비입니다. 마이크로프로세서에 의한 자동제어, 자동 냉각기능, 인체공학적인 설계와 LCD화면으로 조작이 쉽고 간편합니다. 모델은 2구, 4구, 6구 모델이 있습니다. Binary HDT Test Weights (1 set required per station), 1.00Kg Vicat Test Weights (1 set required per station), 5.00Kg Vicat Test Weights (1 set required per station), Light Weight Load rods to test to .45 MPa, Heat Transfer Medium (Silicone oil Dow Corning 350cSt), Nitrogen Blanket, Air to Nitrogen Extractor,Thermal Printer (for 2 & 4 Station), Thermal Printer Paper (for 2 & 4 Station), Water Chiller unit. HDT - Determines the temperature at which a test sample subjected to a predetermined bending stress, deflects to a set distance. 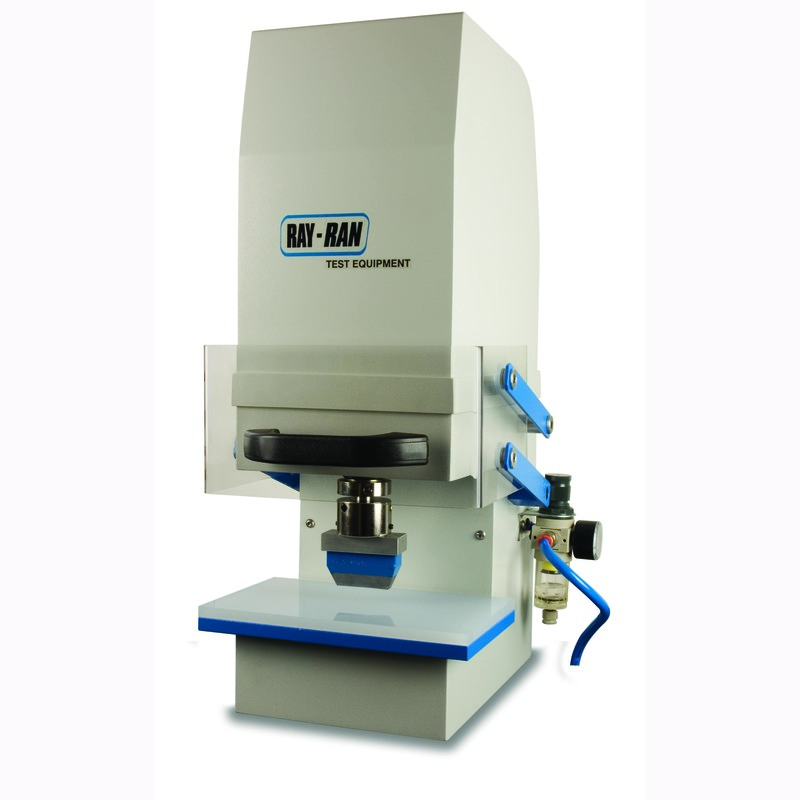 Ray-Ran's Advanced 4 Station HDT/Vicat Apparatus has been designed to allow microprocessor control of the heat deflection & softening point testing for all polymer and plastic materials. HDT - Heat deflection / distortion test, where a standard sized test specimen is subjected to a bending stress, whilst the temperature is raised at a uniform rate. The temperature at which the specified deflection occurs is measured and recorded. Testing is carried out in accordance with the ISO 75 (parts 1, 2 and 3) and ASTM D648 Test Standards. Vicat (VST) - Softening point test, where a specified needle (indentor) penetrates a specifed distance into a sample with a specified load, whilst the temperature is raised at a uniform rate. The temperature at which the sample was penetrated is recorded at the Vicat Softening Temperature (VST). Testing is carried out in accordance with the ISO 306 and ASTM D1525 Test Standards. The 4 Station Advanced HDT/Vicat apparatus allows testing of 4 samples at the same time, with an automatic cooling system, LCD display to provide automatic prompts for test procedures, calibration and results, HDT binary loads automatically calculated by microprocessor, over temperature protection, flatwise / edgewise sample testing, integrated calibration system. Tabular results presentation. The Ray-Ran Model 1 CNC Milling Machine is a vertical 3 axis rapid prototyping machine tool that is ideal for cutting thick test samples and components. The machine is supplied as standard fully guarded with a wide up and over door which has an electrical interlock for user safety and emergency cut out switch. With USB connection the machine is connected to a personal computer or laptop, and is operated using the versatile but user friendly Windows™ Flashcut CNC PC software. The 8000- 34000rpm spindle is capable of cutting materials in 3 dimensional, simultaneous motions. 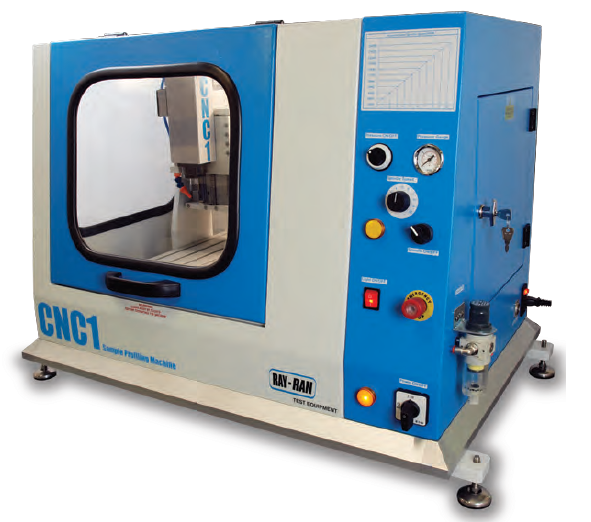 Pre-written CNC programs are available direct from Ray-Ran for any shape or size of test sample to any International test standard, eliminating the need for CAD trained operators. For the advanced user, the system has been designed to accept industry standard G & M codes ensuring full compatibility with leading professional computer aided design software. Unlimited part program size capability allows files to be run as large as your computer's hard drive will allow. No previous CNC programming experience is required as 2 dimensional CAD drawings in *.dxf drawing file format can be imported into the Flashcut software. Once required parameters have been entered, Flashcut automatically generates the G-Code program to machine the sample. 300 mm x 260 mm x 80 mm XYZ axis, 500 mm x 440 mm table size, Variable spindle speeds from 8,000 rpm to 32,000 rpm, Optional Tool Changing System available, Small footprint design for desktop or bench mounting, Totally enclosed safety cabinet for user protection, Emergency Stop Button, Single line and continuous run modes with manual feed rate override, Computer interface with cabling and Windows™ Flashcut CNC PC software, Drop down menus with graphical display ■3 Dimensional graphical tool path preview, Low cost CNC programs available to any International test standard, Set of 3 Carbide milling cutters, Vice and clamps, Uses industry standard G & M codes ■ Product user manual, CE declaration of conformity, 1 year return to base manufacturer's warranty. Ray-Ran can provide pre-written programs. 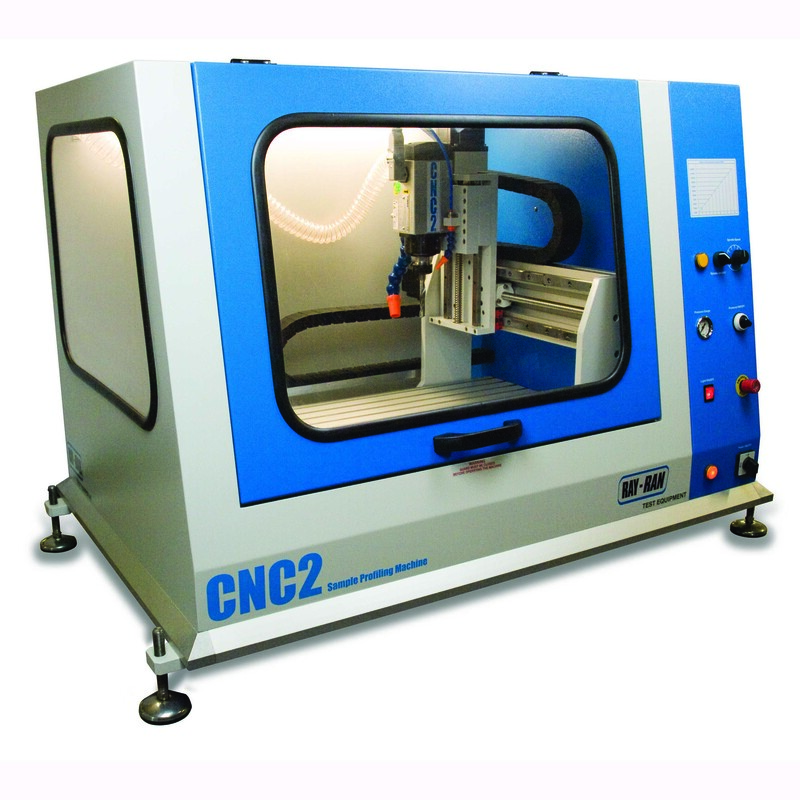 A vertical desktop CNC milling machine for rapid prototyping and production of laboratory test samples from thick sheet material or pipe sections up to 65mm thick Supplied as standard with a USB interface for a personal computer or laptop, and versatile but user friendly Windows Flashcut CNC PC Software. 사용자에 의해 지정된 모양으로 제작된 Cutter 를 이용 얇은 필름을 Cutting 합니다. Trammel Cutters Ideal for cutting an accurate strip of thin film material. 저온에서 플라스틱 고분자 재료에 충격을 가 했을때의 취성 측정에 사용됩니다. ISO 794 및 ASTM D746 에 따라 측정 시편의 50%가 부스러지는 온도를 측정합니다. Designed to study the effects on plastic polymers when subject to impact loads at low temperature. Many materials which are flexible at normal ambient temperature become brittle at low temperatures, which severely affect the material�s impact strength. By plotting the percentage failure rate of the test samples against the reduction in temperature, the brittleness temperature where 50% of the test samples will fail can be determined as per the ASTM D746 and ISO R974 International Test Standard. 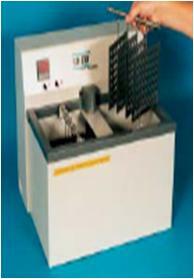 The Ray-Ran Low Temperature Brittleness Apparatus consists of a tank, which by using Dry Ice is bought to the starting temperature. The samples are placed into the clamping mechanism and fixed into the tank and subjected to a single blow after the specified conditioning period has elapsed. The samples are removed and examined to determine whether they have failed or not. The temperature and number of failures is then recorded. By increasing or decreasing the temperature the lowest and highest temperature at which all the samples pass and fail can be determined. Test specimen Cutter to produce test samples, Test specimen clamp to hold the test samples in a cantilever beam support, Test specimen striker, Insulated bath with digital temperature control and integral stirrer to ensure a uniform bath temperature, Temperature range from - 70oC to 200oC, Product user manual, CE mark of conformity, 1 year return to base warranty. 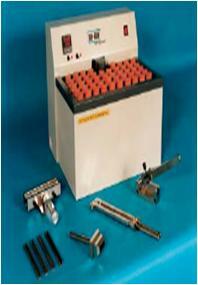 Type A, B or C Cutter, Specimen Clamps to customers specifications. To determine the Impact Resistance of polymer materials at low temperatures. The temperature is determined at which 50% of the test samples fail. BS2782 : Part 1:Method 104B 에 의해 저온에서 플라스틱 재료의 뻣뻣한 정도 (Stiffness) 를 측정합니다. 연질 PVC 압출 재료의 저온 굴곡 시험에 사용됩니다. Cold Flex Temperature Tests. Conforms to BS2782 : Part 1:Method 104B. Determines the effects of low temperatures on the stiffness of the polymer material. The appartus consists of a fixed clamp and a revolving clamp which holds the test sample rigidly at each end. The test sample is submerged in a Low Temperature Liquid Bath. The revolving clamp connects to a pulley dial indicator, graduated in 1 degrees, which is subject to a given torque produced by a dead load acting at a fixed radius. The pulley dial inicator is locked in the zero position by a punger. The initial temperature is set so that when the plunger is released, the test sample twists about 30 deg C. The temperature is then increased by 2 deg C / min and the amount of twist measured every 5 deg C. When the angle of twist obtained is 400 degrees or greater, the resultant temperature is recorded. 시편에 열품을 불어넣어 열에의한 노화 현상을 측정합니다. 6구로 구성되었으며 구당 8개의 시편 장착이 가능해 한번에 총 48개의 시편을 동시에 시험가능 : BS 903, BS 6746, BS 5691, ASTM E95 규격에 의한 실험을 합니다. 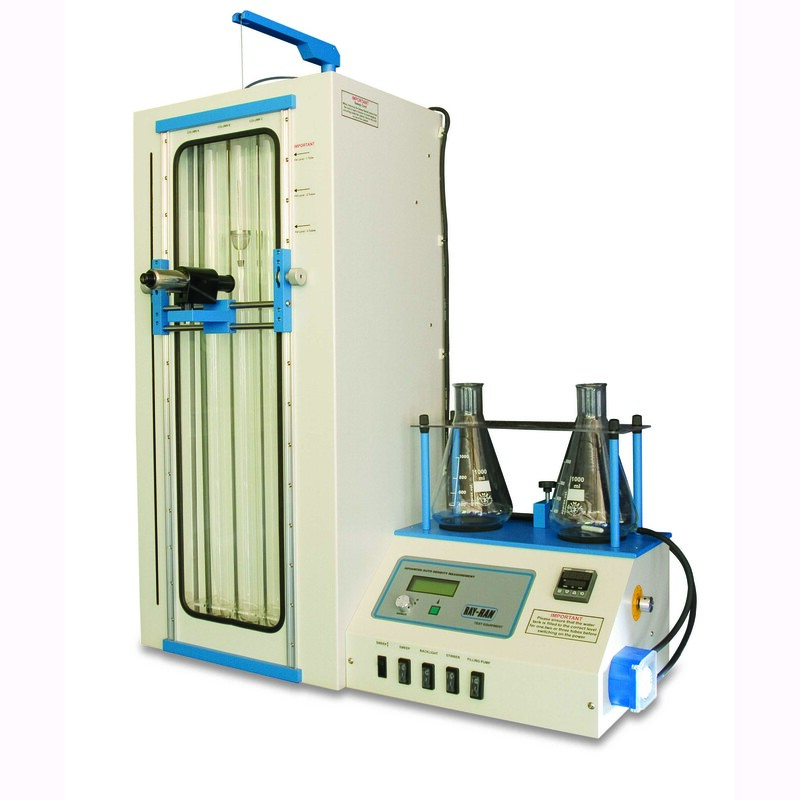 This apparatus has been designed to study the thermal endurance characteristics of materials. The Ray-Ran 6 Cell Thermal Ageing apparatus accelerates the ageing process by passing a constant flow of heated air over the samples. At set time intervals the test samples are removed and inspected, or tested for any deterioration. 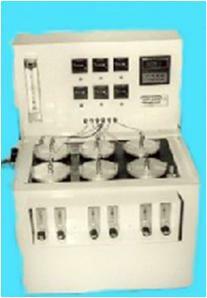 The apparatus consists of 6 individual test cells with up to 8 samples per cell, thus allowing 48 simultaneous tests to be undertaken. 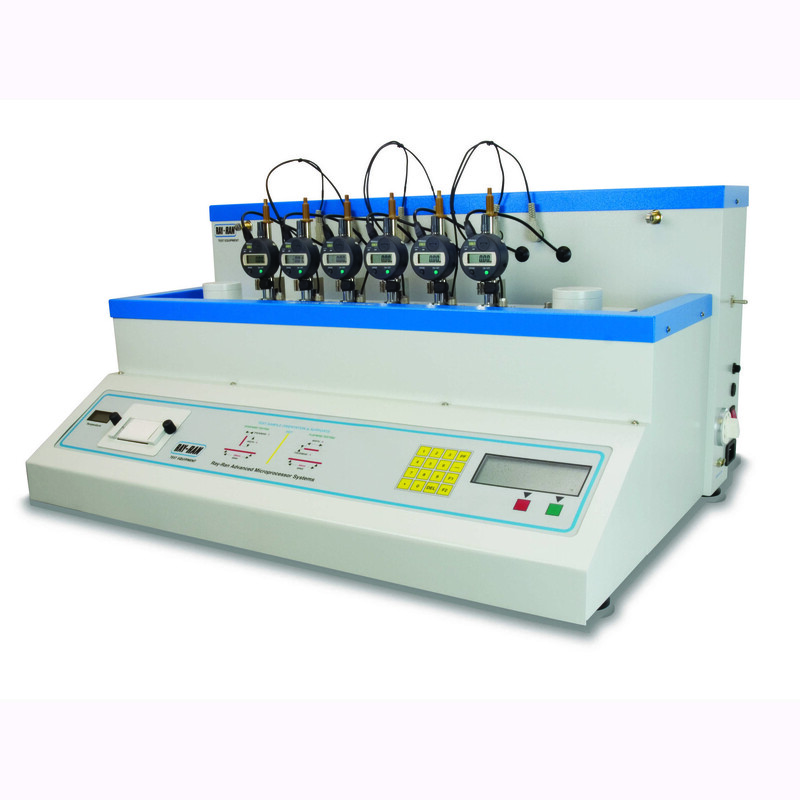 Individual test cells, each with its own elapsed timer, Holders for dumbbell tensile samples, Constant temperature controlled liquid bath with digital temperature display, Tank capacity 30 litres, Variable volume changes between 50 -500 cm3 per hour, 6 way switchable temperature indicator to monitor the temperature in each test cell, A calibrated glass flow meter with a flexible inlet pipe can be connected, Fully traceable certificate of calibration, Product user manual, CE mark of conformity, 1 year return to base warranty. The test samples are suspended in a precisely controlled environment with temperature controlled air continually being circulated through each Test Cell at a constant flow. The Test Samples are checked for Thermal Aging at set Time Intervals and the condition recorded. 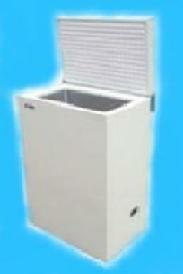 RR/TAA 6 Cell Thermal Ageing Apparatus. ASTM D1698 에 의해 측정 시편을 Notch 하여 목표 스트레스값 적용을 위해 샘플을 ‘U’자형 부위에 접어 넣은 다음 가열한후 일정한 시간 간격으로 Notch한 샘플의 Crack 형성을 Check 합니다. Environmental Stress Cracking. is one of the most common causes of unexpected brittle failure of thermoplastics polymers known. Research has shown that the exposure of polymers to liquid chemicals accelerate the crazing process. 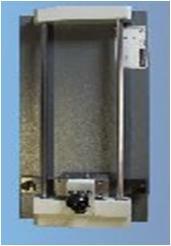 The Ray-Ran Stress Cracking Apparatus has been designed in accordance with the ASTM D1693 test method, it is simple to use and an extremely cost effective method of determining a polymer material's susceptibility to stress cracking when exposed to different environments such as soaps, wetting agents, oils and detergents. The material is cut to shape with the die cutter provided and notched and then the test sample bent into a "U" section to induce the required stress. The samples are placed into the sample holders which are then transferred to the glass test tubes. These tubes are filled with the selected environment and heated. At timed intervals the samples are checked for any cracks developing adjacent to the notch. The number of failures is recorded. The test sample is notched and then bent into a "U" section to induce the required stress. The samples are placed in the glass tubes, filled with the selected environment and heated. At regular intervals the sample are checked for any cracks developing adjacent to the notch. 지정된 치수의 필름 시편을 설정된 온도의 열판위 Cover plate 로 덮고 일정시간이 경과한후 시편의 수축 정도를 측정합니다. Although the Hot Plate Film Shrinkage Apparatus is not controlled by any International test standards, it is still a very widely used apparatus, providing information sufficient for most quality control procedures. Where precise results are essential, the Ray-Ran Unrestrained Linear Thermal Film Shrinkage Apparatus should be used. The principal of both the hot plate and the immersion methods are the same, notably to determine the amount of shrinkage of a film when heated to release the internal stresses produced due to the manufacturing methods. The hot plate method is very simple and quick to understand. A film sample of round or rectangular shape is placed on a hot plate maintained at a constant temperature, and with its surface lightly oiled with Silicone oil to ensure good heat transfer from the hot plate to the film. A light cover plate which keeps the film flat is placed on the top of the film sample. After a set time the film is re-measured and its percentage shrinkage determined. 50mm dia Test Sample Cutter, Hand operated Cutting Press. A Test Sample of the material is cut and its orientation with respect to the manufacturing process marked. It is then lightly coated with Silicone Oil and placed on the Hot Plate for the required time, after which its measured and the shrinkage determined. RR/FSHP - Hot Plate Shrinkage Apparatus. FSHP 013 - 50mm Diameter Cutter. ASTM D2732 에 준하여 Plastic film & Sheet 시편의 가열된 액체 속에 잠긴 상태에서의 시편의 수축성을 측정합니다. 실험실에서 휴대 가능한 소형 냉동기로써 모델에 따라 최대 -60℃ 까지 냉동이 가능합니다.